It’s a curious disqualification considering that state law requires municipalities to accept the lowest “reasonable” bid in such situations. The low bid on the analysis project came from Drakeford, Scott & Associates of Durham, whose submitted quote was $151,200. But the city hired BBC Research and Consulting of Denver, CO, to conduct the year-long examination of how it awards construction contracts. BBC has said it will do the work for $319,948 – which is more than double Drakeford, Scott’s price but in fact the second lowest price tag among the six companies who submitted bids. Still, a bid that is $169,948 higher between lowest and next-lowest bids has left the folks at Drakeford, Scott nonplussed. “After the contract was awarded, some folks from the city [Asheville] called us and we had about a thirty-minute conversation with them about their selection process,” Dr. Derrick Drakeford, CEO of Drakeford, Scott told Asheville Unreported. “At one point they said they didn’t think we had understood their requirements or we wouldn’t have quoted so low,” Drakeford said. “We’ve been in business successfully for 15 years,” Drakeford said. “We know how to read an RFP [request for proposal] and tailor a proposal to fit it. We can quote on disparity studies like the one Asheville wants for a hundred and fifty thousand dollars all day long and not shortchange ourselves,” he said. “I was a little taken aback,” he said. Of the remaining four companies’ quotes, three – MGT of America, of Tallahassee, FL; Mason Tillman Associates of Oakland, CA; and Griffin & Strong PC, of Atlanta – were clustered within $25,000 above BBC’s price. The high bidder, Miller3 Consulting, also of Atlanta, weighed in with a quote of $445,285. Nevertheless, the announcement that BBC had been employed to do the study raised numerous eyebrows. Why, Ashevillians wanted to know, was the city hiring a nearly all-white company from what has been called one of the "10 least diverse cities"), 1300 miles away, to conduct a study of minority hiring practices in Asheville? “We are not yet under contract, so I would encourage you to direct all of your questions to [city economic development specialist] Brenda Mills at the City of Asheville,” said Dr. Sameer Bawa of BBC Research and Consulting (the winning bid). So Asheville Unreported turned to the city. The only specific answer to questions about Asheville’s choice came through city communications specialist Polly McDaniel, who said BBC was chosen for its overall qualifications and also “as a plus, it utilized an attorney certified by the North Carolina Bar.” She did not indicate whether this meant BBC employed a North Carolina attorney in preparation of its proposal, or whether BBC retains a North Carolina law firm for use as needed. “That seems odd,” Drakeford said. “Anyone who bid on this contract would have consulted a North Carolina law firm as part of its research. We’re a North Carolina company and two members of our management team are attorneys. The uncle of one of them is the current president of the North Carolina Bar Association. “In all two state judges, a civil rights attorney and our own counsel reviewed our proposal before we submitted it,” he said. “The City listed this contract on its website, as well as the State of North Carolina Interactive Purchasing System’s website,” Sam Powers, the city’s ‎Community and Economic Development Director told AU. “The City also marketed this contract through professional trade associations such as the Carolinas-Virginia Minority Supplier Diversity Council,.” he said. Having posted its RFP online, the city then waited for responses. “[We] received the RFP through one of [our] RFP search engines,” said Dr. Fred Seamon of MGT, the Tallahassee-based bidder. “MGT`s interaction was limited to attendance at the pre-proposal conference and written responses to questions submitted by MGT during the Q and A period,” he said. It is not known which of the other four companies sent staff members to the pre-bid conference. The meeting was conducted by Mills, who is on vacation until June and not available for comment. Why a new disparity study now? Or at all? The city’s previous disparity study was conducted in 1993 by MGT of Tallahassee (one of the bidders) in collaboration with Research and Evaluation Associates of Chapel Hill. That study identified several shortcomings with regard to the awarding of contracts to minority-owned firms, as well as other race-based policy shortfalls. The report’s findings were largely responsible for the subsequent establishment of Asheville’s Minority Business Program (MBP), whose purpose is to help grow and nurture minority-owned companies. But the Minority Business Program has had a rocky time of fulfilling its mission; local officials and observers have said it lacks focus. (It failed to file its required annual reports for the years 2009-2012 ) Absent MBP input the city appears to have been operating in a vacuum with regard to remedying its minority engagement shortcomings. Staffers have admitted the city does not track goals for awarding minority contracts. Since millions of dollars’ worth of work will soon be up for grabs with the East of the Riverway Development Project, a new disparity study seemed urgently in order. Particularly since somebody noticed – and pointed out – the city’s abysmal minority hiring record. In 2015 the city awarded some $$66 million in contracts, of which less than $1.8 million went to black, Hispanic, Native American and non-minority female vendors. Strictly construction contracts were even more starkly skewed:. A total of $251,790 was bestowed among Hispanic and Native American-owned companies and $337,580 to businesses owned by white females. A total of $260 (that’s two hundred and sixty dollars) went to black companies. Clearly, the city felt, Something Should Be Done. There were those, however, who questioned whether a full-scale disparity study was either necessary or cost effective, given that much updated material could be obtained through such sources as Asheville’s African American Heritage Commission and the Dogwood Alliance. One objector was city councilor Cecil Bothwell. “I didn’t support contracting with anyone to do this study,” Bothwell told AU. “ I don’t recall the circumstances of whatever vote occurred - and if I voted “yes” for the concept I am quite certain I didn’t agree to the cost. “I’d have much preferred to spend this kind of money on real work instead of another study of what sort of work we need to do. “As for the [North Carolina] attorney question, ‘Well, duh?’ Bothwell said. For all the talk of lowering taxes and concern over the affordable housing crisis, Asheville City Council and its management has gone whole hog into economic development in exchange for the promise of a massive explosion of growth. Don't listen to the talk. It's an election year and politicians say what you want to hear. Instead, look at the proposed budget for fiscal year 2017-2018 and you will see exactly where the city puts its priorities - a growing bureaucracy and massive debt. In addition, the City could have lowered the property tax rate to 39.5 but instead, added back 4 cents in taxes. Hidden in this year's budget is a significant personnel change - the addition of 100 full-time positions. This kind of increase has not happened since 2007-2008. City management has been increasing full-time positions at significant rates for the last 2 years, adding more than 76 new positions. By the end of this fiscal year, it will have added 23 more, bringing the total to 100 new full-time positions. Keep in mind, Gary Jackson started with the City of Asheville in 2005 with 1,060 full-time employees. Almost immediately he began hiring and by fiscal year 2007-2008 budget, had created 100 additional full-time positions just before the recession. It appears the City has recovered from the recession and now has again added another 100 full-time positions with this fiscal year bringing the total projected full-time positions to 1,248. Why is that significant? A growing bureaucracy rarely gets smaller and in the case of Asheville, comes with high salaries and benefits. Since 2015 and if this year's budget is approved, salaries and benefits will have increased $10.5 million for a total of $90,481,460. The City's main source of revenue is the property tax revenue. The City needs every bit of property taxes to pay for salaries and benefits. The City projects $63 million in property tax revenue for this coming year, making them $27 million short in paying employees and their benefits ($90 million expenditure). Whatever additional revenue comes in pays the salary shortfall and the rest of the operating expenses of the City. It's no wonder that the City increased rates on city services this past March, even before this year's budget. They need every penny of parking, stormwater and water revenue possible to pay the remaining operating expenses. You would think the City has dramatically grown to account for such increases in staff and salaries but really, it has not. According to the US Census, the City's population in 2010 was around 84,000. As of today, it's around 88,000. Part of the growing bureaucracy and salary increase is due to the new department the City created in February 2017 - the Capital Projects Department. The City now has capital improvement projects of over $200 million in the next 5 years. Essentially, the City has created its own construction management department and become a municipal developer. This was not necessary prior to 2014 when the 5 year capital improvement program budget was a mere $53 million. By 2014, that number went up 149% to $132 million when the RADTIP project was approved. What has also grown is our municipal debt and the City has no problem increasing that waistline beyond what its financial frame was meant to hold. The City now has $200 million in planned capital improvement projects now divided into two main categories - the GO Bond CIP of $74 million and the 5 year rolling City CIP of $121 million. Last November, voters approved a $74 million bond to go toward affordable housing, parks & rec, and transportation. While City taxpayers could have seen a massive property tax decrease, the City instead added back a 3.5 cent tax to pay for the "GO bond debt service." The problem is this: According to the Local Government Commission, the City of Asheville has not yet made any moves to issue the $74 million bonds as of this writing and apparently doesn't plan to for an entire year. Therefore, the City will be collecting this 3.5 cent tax for an entire year on bond projects not scheduled to start until FY 2018-2019. See page 148 of the City's budget. The schedule clearly reflects the estimated cash flow plan for the GO Bonds. Only $200,000 is scheduled to be spent in this Fiscal Year 2017. The GO Bond projects will NOT start until Fiscal Year 2018-2019 (that's July 2018 through June 30, 2019). So, why not give taxpayers a break and hold off on the 3.5 cent tax increase? The amount collected on the 3.5 cent tax will be approximately $5 million. What will the City be doing with that $5 million in the meantime? Even before the GO Bond referendum adding $74 million in capital improvement projects, the City already had a hefty 5 year capital improvement plan of $121 million. Adding the bonds to this and the City now has over $200 million in capital improvement projects with $34 million expected to be spent this year. In addition, this year's budget format has significantly changed. It is difficult to tell how much of this is being paid for out of general funds and how much will be paid by debt. In last year's budget, the City projected almost $100 million (of the 5 year total) would be debt financed and $19 million to be debt financed just for fiscal year 2017-18. The proposed budget reveals the City's priorities - a growing bureaucracy with high salaries and large economic development projects putting the city and its taxpayers into massive debt. In a year when property revaluations may force some to sell, are making affordable housing harder to come by and squeezing fixed income residents even more, the City could have lowered the tax rate even more if it had not added back the 3.5 cent tax for bonds. If you wish to comment on any aspect of the City's budget, attend the May 23rd City Council meeting at 5pm. It will be the only time you can give public comment specifically about the budget prior to the June 13th adoption of the budget. 1) The final draft of Form Based Code vote was met with surprising opposition and narrowly passed by 3 votes. 2) Members actually started asking questions about the cost of the RADTIP and who would be responsible for paying for those costs. For the first time since its inception in 2010, this Commission, which was setup by the City of Asheville had to take an actual vote count with regard to the proposed final draft of the Form Based Code put online April 25th. They had been asked by Stephanie Monson Dahl to recommend to City Council that the Council should support this final draft and pass it but rather than getting the unanimous, business-as-usual support, 5 members indicated they would vote No causing lively discussion and City staff questioning the sudden change. In discussions prior to the actual vote, there was lengthy discussion started by member George Morosani who said frankly that he would vote against recommending this final draft if the Form Based Code district called "RAD-RIV" could not be removed. He specifically stated that this is the only area in this part of the City that has access to rail and that rail access is important for certain types of businesses such as recycling. Jason Young, Woodfin representative, voted against it and in his remarks stated that Woodfin aldermen felt it would create a top-down approach to zoning and unintended consequences. 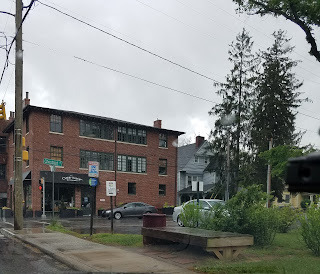 He gave examples such as the 700 sq ft building in front of Walgreens on Merrimon Ave and Staples, also on Merrimon Avenue, both of which found ways to comply with requirements of building close to the road. He did, however, first state that Woodfin was not there to dictate to the City of Asheville how they do their zoning but only to share their thoughts on the matter. Karl Koon, riverfront property owner. In addition to unintended consequences, dissenting members stated they did not want to tie the hands of the current property owners. Furthermore, they said there are a lot of changes already going on because of RADTIP and they thought it would be better to wait to make such drastic zoning changes until after the construction was completed (in 3 years) and then see what kind of zoning changes needed to be made. 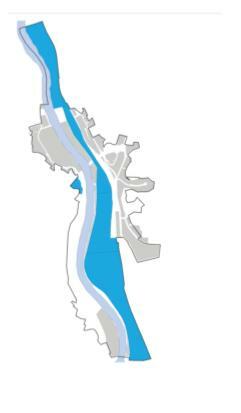 Others cited current zoning tools that can be used to help riverfront development projects such as variances and conditional uses. It was no surprise that professional members who stand to gain from these changes and those closely aligned with the City of Asheville such as the Asheville Convention and Visitor's Bureau would vote for the Form Based Code. Finally, after discussion that made this meeting longer than the usual hour, it came down to a vote. Suggested Motion: I move to recommend the approval of the River Arts District Form-Based Code and find that the request is in the public interest and is consistent with the mission of the Asheville Area Riverfront Redevelopment Commission and the Wilma Dykeman Riverway Plan in the following ways: 1) the code reflects a vision for the area that was developed with all stakeholders; 2) the seven districts will build on the district’s assets and ensure a walkable, friendly public realm; 3) the code offers predictability for developers and property owners investing in the area.proposing to City Council that the AARRC supports this form based code and that it was in alignment with the Riverfront Redevelopment Plan and stakeholders. Peter Sprague then requested an amendment to Mathew's motion that the section known as RAD-River not take effect until October 2022 (after the completion of RADTIP). Mathews denied Sprague's amendment to the motion and the motion, as presented, carried on with Chair Carleton Collins asking for a show of hands. Final count of 8 in favor (Collins, Cartwright, Green, Brown, Turner, Bothwell, Mathews, Sprague) and 5 against (Whitesides, Young, Quinn, Morosani, Koon). Who pays for RADTIP and what will it cost? [Paraphrasing] "We want you to make a recommendation to council regarding their funding for the rest of this program. The last time a budget was adopted was in 2014 when we were awarded the 14.6 million tiger grant. The 14.6 million will pay for constructions costs only - hard costs. It doesn’t cover engineering, utility relocation, land acquisition. It does not cover over escalating construction costs." "In the budget we had $38 million but we know we need more. So far, we already have costs above the $38 million. We don’t expect costs to exceed $50 million. We want you to recommend to Council approval." And, like a light coming on in the attic, it seemed as though this Commission realized it had been working on the design of a mega mansion but now it was time to start building, and that means, it's time to come up with the actual money. Planning had been a lot of fun but as Mrs. Mathews put it, "There are all kinds of things I want for my home, but I don't necessarily get them all." Members questioned "how can we make a recommendation when we don’t know about the total cost? Don’t we have a fiduciary responsibility?" Others cited their responsibilities to be stewards and did not want to put a burden on taxpayers. Some asked whether things could be cut out if they find they don't have the funds or will cause too much of a burden. One particular exchange was very interesting: Stephanie Brown indicated she wasn't ready to make that kind of recommendation without knowing the costs or knowing if anything could be cut. Dahl responded that there wasn't anything that can be cut without it impacting our federal grant to which Ms. Brown said, "We have to do this no matter what it costs? "You don’t have the numbers and you’re not going to have them before Council reviews the costs...instead of talking clearly about numbers, you can recommend impacts." City Manager Gary Jackson then stepped in to clarify. "We are running up against the timeline to use the grant. We are on the critical path." Jackson, confirmed that the City will be reviewing any and all details and plans and stated that the protected bike lanes were added to the RADTIP project but were not part of the RADTIP project and the federal funding. If the bids come in too high, they may cut the protected bike lanes. In the end, the Commission voted to support the RADTIP project. We don't have the final language but one thing is clear: The Asheville Area Riverfront Redevelopment Commission has found its voice and is finally representing stakeholders other than themselves. If you wish to comment on this or the City's Proposed FY 2017-18 Budget, attend the May 23, 2017 City Council meeting at 5pm at City Hall. This is the ONLY meeting in which public comment specifically on the budget is allowed. At this time, City Council is scheduled to review construction bids for RADTIP at its June 13th Council meeting. The City of Asheville has engaged BBC Research and Consulting, of Denver, CO, to evaluate city contracting practices with regard to minority-owned businesses. BBC will begin work next month on a “disparity study” designed to show how well the city succeeds – or doesn’t – in awarding contracts to minority- and female-owned businesses. The project is expected to take a year and will cost the city $320,000. At the end of the day, the study is expected to provide city officials with a blueprint for implementing a race-based system for awarding city work contracts. The project has been triggered by a perceived need to overhaul the city’s existing Minority Business Program as work advances on the ambitious River Arts District development plan. Concern has arisen in some quarters that black contractors, in particular, might not get a fair shot at bidding on riverfront projects, given what some have said is an abysmal track record in employing black companies. Yet, to evaluate its minority business hiring practices, the city has engaged a firm headquartered 1,300 miles away in a city that is 80% white; one that, judging from its own profile, is young, hip … and lily white. These are members of the group that will spend a year compiling data, organizing community meetings and interviewing focus groups in an effort to disclose why less than 3% of the city’s development dollars are spent with minority operated businesses. Late last year, as the city prepared to start letting bids for work on the Riverfront Arts District Transportation Improvement Plan (RADTIP), black community advocates, in particular contractor and city council candidate Dee Williams, voiced concerns that if the usual pattern were followed, black business owners would see precious little of the millions of dollars’ worth of work that will be up for grabs. In 2015, Williams pointed out, the city awarded some $$66 million in contracts, of which less than $1.8 million went to black, Hispanic, Native American and non-minority female vendors. Strictly construction contracts were even more starkly skewed:. A total of $251,790 was bestowed among Hispanic and Native American-owned companies and $337,580 to businesses owned by white females. A total of $260 (that’s two hundred and sixty dollars) went to black companies. Whether it was that figure itself or the making public of it that hit a nerve at city hall, the result was an almost immediate assertion that the city, indeed, needed to Do Something. In true Asheville fashion, the immediate response was to call in a consultant; after all, there had been no evaluation of the city’s Minority Business program since soon after its inception in the early 1990’s. Study of the City’s contractual awards in construction, goods, services, architectural and engineering services for the period Fiscal Year 2011 through Fiscal Year 2016. ∙ To determine the effectiveness of the current programs and recommend modifications and adjustments, if necessary, to the City program that are in compliance with law based on the opinion of an attorney licensed in the State of North Carolina who has substantial experience in this area of law. Six companies responded to the city’s RFP, with cost quotes ranging from $151,200 to $455,825. The city chose BBC, whose bid was $319,948. But wait … why not use our own resources? And why do it at all? It’s not as though Asheville/Buncombe County doesn’t have its own resources for diversity research. Finding answers to the questions the city says need answering would seem to be right down the alley, for instance, of UNCA’s Center for Diversity Education. Its Undergraduate Research Program specializes in faculty-mentored undergraduate fact-finding tasks, many on behalf of third parties. For that matter, why go through this exercise at all? Comments from many minority residents, on hearing the study had been ordered, indicate they don’t buy the need for it; in fact, they say that if the city wants to spend some money, they can think of far better places to spend it. In a post she titled “City Racial Disparity Program Plan Raises Questions,” Asheville blogger Ami Worthen listed several such comments. So why spend a third of a million dollars to hire a smallish -- and thoroughly white -- consulting firm headquartered in one of the whitest major cities in America? (Source: Ten Least Diverse U.S. Cities — Including One in Metro Denver). Well, the city cited BBC’s experience and qualifications, as well as those of its staff; the professionalism of its overall proposal, and the estimated cost. And they’ll be in and out of Asheville for a whole year. The wheels on the bus go ‘round and ‘round … and the taxes creep up and up. The city wants to collect more money for its transit system. To pay for what? Now, the conventional definition of “transit” is “the carrying of people, goods, or materials from one place to another.” and the inference is that ART gives new meaning to the word by making riding the bus in Asheville a pleasant, efficient and thrifty way to get around town. But as the city plods through its annual preliminary budgeting process, ordinary folks looking to get where they need to go are clamoring to be heard, while the transit system itself remains in chronic disarray and the only solution actually on offer is a (further) hike in property taxes. Some critics of how the city’s transit system is run – or not – are quick to say that this amounts to an unfocused attempt to fix an ongoing, multi-level problem by throwing money at it. Others, including some bus riders themselves, say it’s not enough and that the city should consider diverting funds from other proposed expenditures – such as beefing up the police department – for further transit operation improvements. In 2009 the city adopted in principle a $6.1 million transit master plan ("TMP") that called for replacement of buses with new hybrid models, plus revamped bus routes and sweeping improvements in amenities, among them unilateral Sunday bus service. But adopting the TMP and implementing it proved to be two different things. The plan mostly languished until, late in 2012, the city got hold of enough federal and state money to buy nine new buses and slap the new ART logo and color scheme on them. In late 2014 the city pried loose $112,000 from its general fund to match a one-time federal job access grant. The combined monies paid for a year’s worth of Sunday service, but left COA scrambling for funds to keep Sunday rides going. Then the TMP dozed off again while folks began to point out that instead of coming to grips with its transit problems the city was enthusiastically pouring time, energy, and money into the sexier aspects of multimodal transportation: greenways and bike paths. And meanwhile there came a swelling chorus of complaints from ART customers about the quality of existing services. Thanks to a Byzantine difference between state and federal transportation laws, the City of Asheville is required to have an outside company manage its transportation system on a day-to-day basis, with oversight by city employees. In 2008 COA hired Professional Transit Management ("PTM") to maintain and run its bus fleet. In 2011 PTM was swallowed by the French conglomerate Transdev and that year – the same year that it unveiled ART – COA signed an initial three-year contract with Cincinnati-based First Transit. In 2015 the city decided it probably should do something, so it decided to put the transit system management gig up for grabs on a year-to-year basis. But first it renewed the First Transit contract for another year. Thus, in February, a year and a half after it was originally suggested, the city put together and circulated a request for proposals for a turnkey operations and maintenance contract for ART. Deadline for filing RFP’s, according to the document, is this May 2. Also in February, Just Economics declared the observance of “Transit Week,” a seven-day event that focused on the 19-point agenda. Some of those points, advocates said, have received some attention but the most important ones, they said, have not. Then there’s the money. Or not. 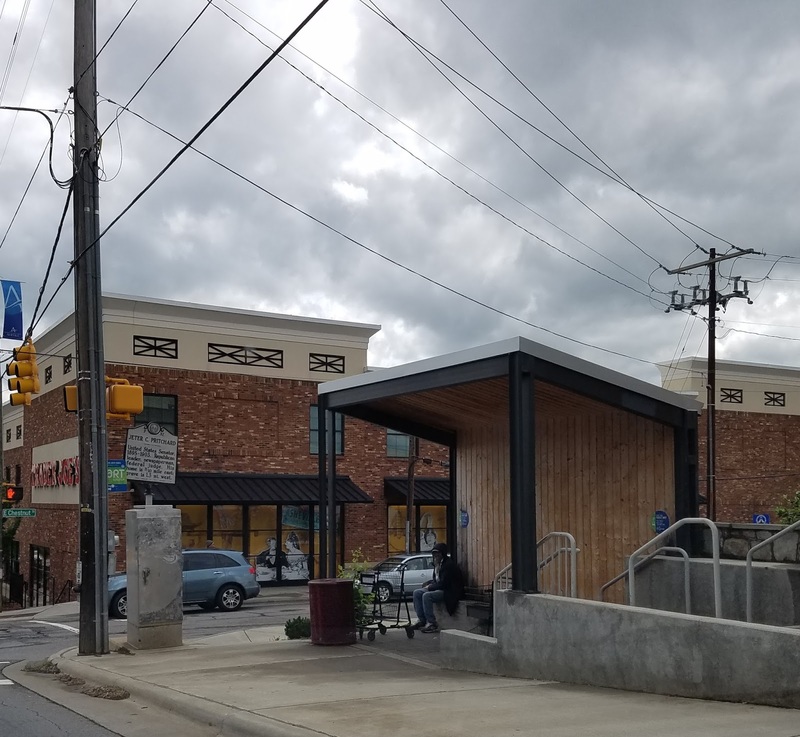 Just Economics would like to see an immediate increase of more than $3 million in Asheville’s transit budget. Corner of Chestnut and Charlotte St.
Other transit advocates, looking to shake the tree, have taken an either/or approach to transit funding. At a March city council meeting, while Police Chief Tammy Hooper was inside asking for an additional $1 million in the face of a soaring downtown crime rate, members of the group Beloved Asheville picketed outside, calling for that money “to go to the people,” especially for job training and better bus service. Don’t fret, bus riders, the city said, we’ve got you covered. Well, partly, anyway. At a budget work session on April 12 councilor Julie Mayfield, a former city Transit Committee chair, suggested a hike in city property taxes to cover the implementation of two transit projects: expanded Sunday service and adding evening hours for some bus routes. The costs involved would be about $630,000, and a tax increase of half a cent would more than cover that amount, she said. Mayfield’s proposed tax hike cannot be voted on until the presentation of the finished budget in June. Council members Brian Haynes and Cecil Bothwell originally mentioned a full one-cent tax increase for transit and would probably support a compromise. But Mayor Esther Manheimer seems ambivalent about adding to Ashevillians’ tax burden, as does Councilor Gordon Smith, whose caution seems at odds with his previously passionate advocacy of transit funding. “This [transit] is a core city service. It is like water, it is like police, it is like fire, it is something that we must do,” Smith said in 2015. Meanwhile, the city has said it intends to shift its transit focus from infrastructure and management details to fleet update over the next few years, and will accordingly use such capital as it can muster to phase in new buses, replacing the system’s aging coaches, some of which are 12 years old. At a recent meeting of the city’s advisory Multimodal Transportation Commission, a chart was distributed showing tentative bus replacement schedules for the years 2017 through 2032. During each of the next five fiscal years, according to the chart, the city can avail itself of 20% matching federal funds to help purchase new units, enabling the fleet to increase from 21 to 26 units over that time. Accordingly, this coming year the city wants to purchase two new buses for a total of $920,000, with $184,000 in federal money available. (In fiscal 2018 COA has its eye on six new buses, with a funding allocation of $2.8 million.) CIP moneys have already been earmarked for that purpose, the city maintains. “I presume you’re digging through unspent funds,” member Dave Nutter said. 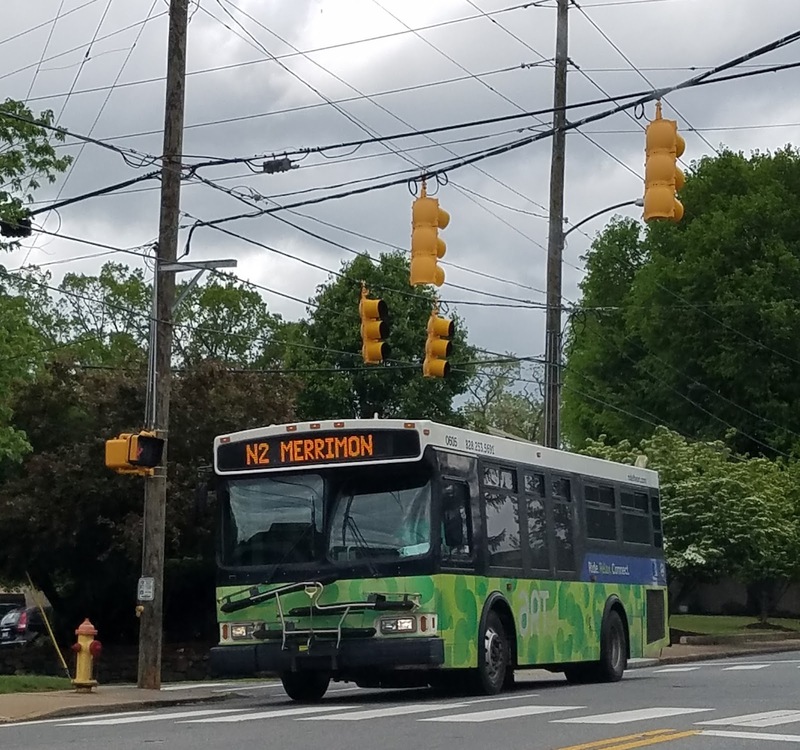 For a while it was possible to ride an ART bus for free in central Asheville, but in 2015 the city eliminated its downtown fare-free zone, saying it was too seldom used and therefore not cost effective. It now costs a dollar to ride, relax and connect with ART. And many riders feel they’re not getting much bang for their buck.